Like I wrote last week, I will be talking again about my trip to Kenya that I took this past January. I went for many reasons, and one included teaching about different farming practices. The program that I helped to teach is called Farming God’s Way. It is a program that was started in South Africa and is spreading all over southern and central Africa. It is a form of no-till farming that they can do by hand. 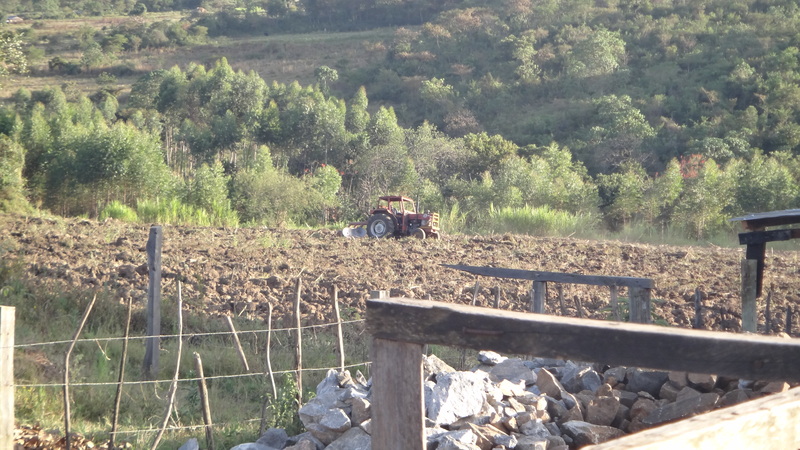 Right now they are plowing their land, letting it sit, waiting for the rain to beat down on it and flush their topsoil literally down hills and into streams and rivers. Then the ground dries up so quickly because they are so close to the equator and with that hot sun, it’s taking so much nutrition from the plants. Their main crop is Maize, or corn. 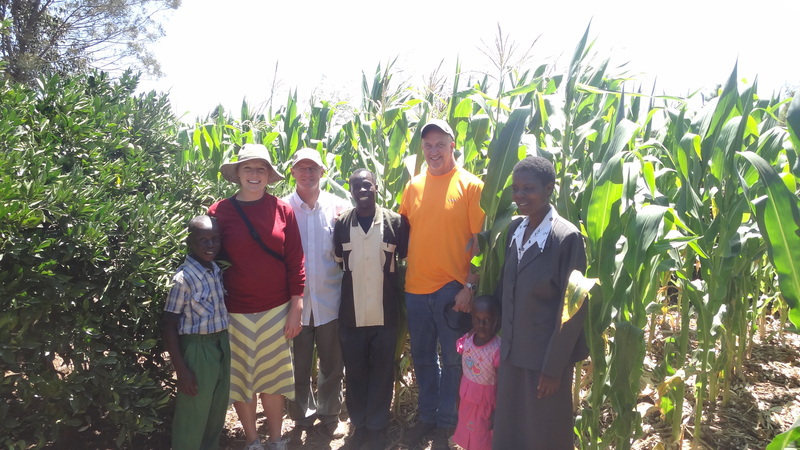 With the traditional type of farming there they are lucky to get one good crop of maize, if they are able to no-till and use mulch to cover their ground, that same plot can get up to 3 or even 4 crops in a year! One farmer’s testimony talks about his shamba’s (farm) succession from his father to him. He was more willing to take a risk and try some new ideas and was taught Farming God’s Way. He implemented the practices and took the shamba from a 6 to 7 bags of maize per year, to over 65 bags per year! I’m telling you right now, this is HUGE! He can now feed not only his family, but he can sell to make income at the market, and also give back to his church in tithes to help his community. This is truly something that has the potential to change the outlook of the hungry in Africa. 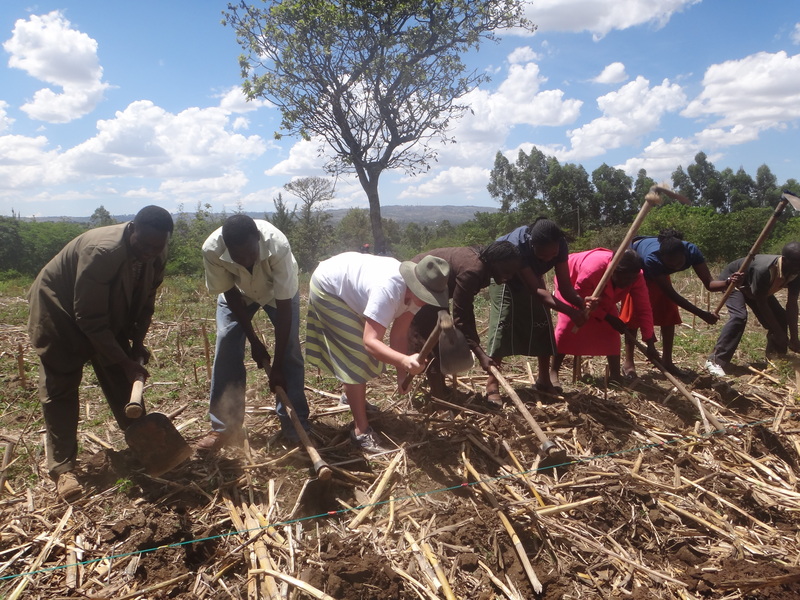 Farming in Kenya with the students! I won’t tell you too much about the details of how this program works, you can look at their website and let me know if you would like more information. I would though like to talk about some challenges and some blessings that have been going on there. Getting food from abroad coming “out of the sky”. This seems like an odd challenge for these people, since they are hungry, you would think that getting food would be a blessing. However it becomes very challenging when they become to rely on the relief packages. Last year some farmers were given seeds to plant for corn, and instead of planting them and nurturing it to bring more food to their families like you would think would be the best option. They ate the seeds and promptly went to the food kitchen to be fed for the rest of the year. I can’t blame them; they are being enabled, in a sense, to be lazy. The neighbor farm plowing to get ready for planting. They will be the first to tell you that it’s hard to change anything in Africa. Which I think is true among many agricultural communities and people. We’re a traditional bunch, and at times change can be considered a bad word. We’re more likely to do something because my dad did it that way, and his dad did it that way, so of course that’s still how we’re doing things! So I think that although some are coming around to a new way of farming, it will still take a long time to get a culture turned around and to start listening to their neighbors and see how this is producing more food. Timing is so important in farming. When it plant, fertilize, harvest, etc. In Africa time is usually the last thing on their minds. Time goes at its own speed there and it is of no importance, I can’t even count the number of times they would say a class would start at 9, 9:30 rolls around, maybe even 10 before it really starts rolling. So that was a hard concept to get across, that you have to do things in a timely manner. For instance when your weeds are only 1-6 inches tall and you’re hand weeding. It will take one person 7 days to hoe a hectare. The weed cycle there is 10 days, so you would have 3 days free to do other crop maintenance. But if you wait until the weeds are 7-14 inches tall, it will take that same person 13 days to hoe the hectare. Leaving him instantly 3 days behind and with a huge battle ahead of him. They have a wonderful extension team at the training center. These two men, both named Isaac are incredibly helpful and innovative when it comes to ways to help spread the word when we can’t be there to teach the seminars. 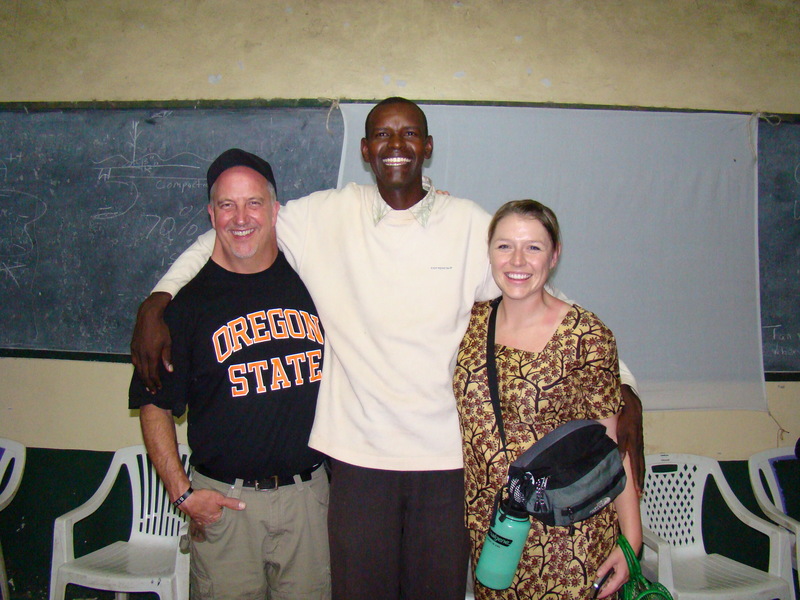 Isaac Rutto goes out into the community all the time to put on seminars and teach classes. He hasstarted teaching in Tanzania with an interesting approach. He taught a portion of the class to a few farmers. Then told them that to get the rest of the class and information they could come back, but only if they brought a neighbor. And so it went on and on, they are up to 80 farmers and still growing!! What an amazing accomplishment. Isaac Mwebe's Family, and their beautiful Maize! continually grow. He works at the Agricultural School that is located at the training center. He not only teaches the practices but also farms this way himself. Well his wife is the actual farmer; he just comes home to help on weekends. He gives her so much credit and she is doing a wonderful job! They have 8 ft tall corn right now and it looks beautiful, it’s also their 3rd crop on dry land! A huge blessing! Their climate is very conducive to many crops. Since they are so close to the equator their daylight only changes by a half hour year round. Also their temperatures never vary beyond about 15 or 20 degrees. The only thing that changes is during the rainy season it pours buckets of rain from about 10am to 3pm. So if they could do a better job of harnessing that water when it does come, and not let it go flying off into the streams with their topsoil, they could truly have huge yield increases. 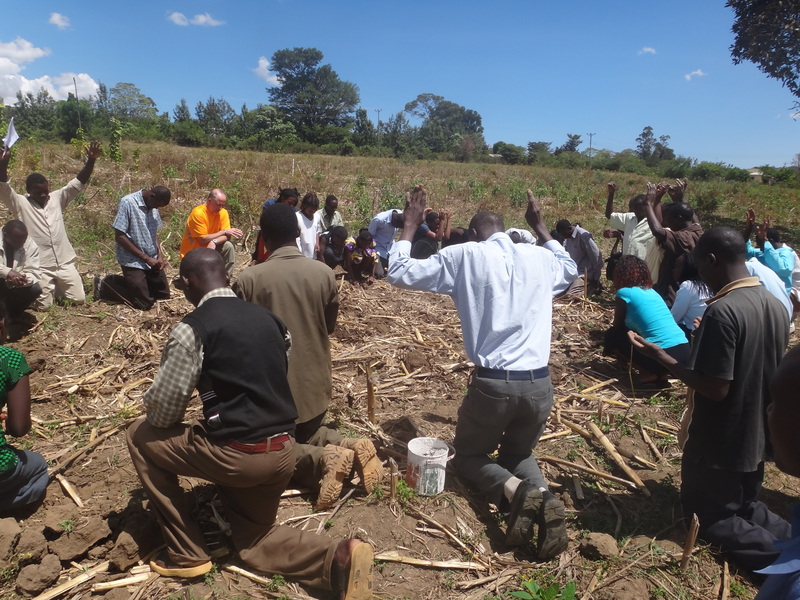 Praying over our community farming plot. right time and with excellence. So farmers now who are using these techniques are finding that it is proving their hope in God is real and they can share that with their neighbor. What struck me most, was their ability to open their arms to us and really truly want to hear what we were teaching them. They were taking notes like crazy, asking questions, and truly paying attention to any advice we could give to them. I thought this was so interesting because I’m pretty sure that if someone came on to my farm and told me they were going to completely change the way I did things, I would probably kick them right off. I think for them however the difference is that they are somewhat at the end of their ropes. People are truly starving and not able to feed their families on what they can produce on their land. I think many of them are at the point where hope is all they have left, and what we have to say, even though it’s different and new, might be worth a shot. This trip was a true blessing to me personally. I got to meet so many interesting people and was humbled by their stories of survival and hope. I think that they live in a world where hope, at times, it just about all you have got in the world. I think that we forget many times how much we have to be thankful for and we owe it to them to give thanks for our fortunate situation here. I hope that you see how we were truly trying to empower the Kenyans in that area to find what works best for them, teach them how to do it, and they leave with a hope that it will continue to be taught! I know that there will be a team going back next year, I’m not sure if that will include myself or not just yet. But I do know that I left a piece of my heart back there and will think of them every day until I get to go back and see how what we taught has helped and find more ways to empower them. Top: Farming God's Way Plot at the Ag School. 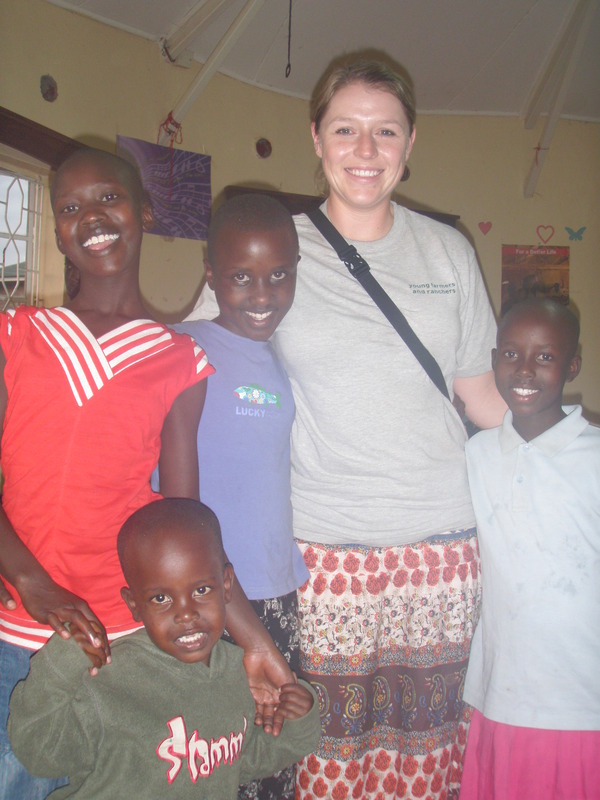 Bottom: Hanging out with a few very fortunate orphans.